Ford's Garage and Cycle Company of Bondgate Street, Alnwick. Homepage. This page: Tins of motor spirit - petrol - purchased from Ford's Garage in October 1919. 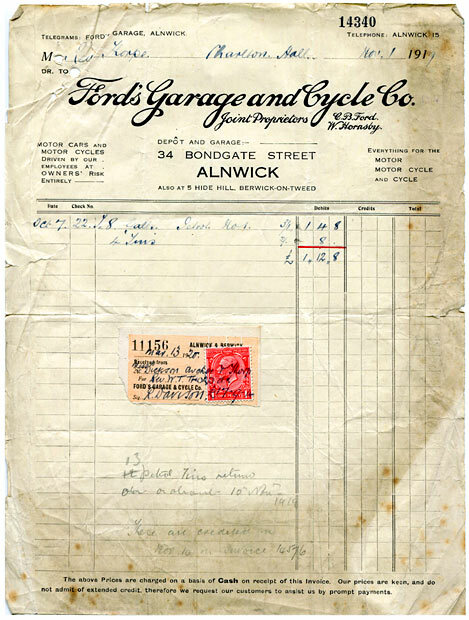 The invoice shown below refers to the purchase of motor spirit by Reverend Thorpe of Charlton Hall, from Ford's Garage and Cycle Co. of 34 Bondgate Street in Alnwick. Dating to 1919, this item of paperwork is a reminder that in the earliest days of motoring, motor fuel was often distributed in two-gallon fuel tins, prior to the widespread introduction of petrol pumps at garages. Here, Rev. Thorpe is billed for eight gallons of petrol, for which £1 4s 8d is charged. In addition, returnable deposits are paid on each fuel tin used, at this time two shillings per tin - therefore eight shillings in all for this purchase. The invoice is dated November 1st 1919, while the fuel was purchased several weeks earlier. A later note written in pencil at the foot of the invoice, refers to the return of 13 two-gallon fuel tins. The garage was situated at 34 Bondgate Street in the town; there is also a reference to separate premises at 5 Hide Hill, Berwick-on-Tweed. The proprietors were given as a C.B. Ford, and W. Hornsby. The lettering used on the invoice is virtually identical to that used by the Ford Motor Company at the time, perhaps the garage owners - one of whom was called Ford - also dealt in Ford vehicles, hence the use of this style of typeface? Certainly the date of this invoice fits with the era of the Model T car, and the TT lorry. Interestingly, the receipt for payment is dated 13th March 1920, so several months after the invoice was raised. I've found few references to Bondgate Street in Alnwick, so I'm not sure it even exists any more. 34 Bondgate Within though does look like it could once have been a motoring establishment. The address in Berwick-on-Tweed definitely does survive though, and is now home to a confectionery/bakery supplies company. A look on Streetview suggests that this location could well have been more of a showroom, rather than a garage, in the 1910-1920 era. A second purchase receipt for fuel dating to 1919, but for ten cans of petrol placed with a different company, can now be found on this page.